The Heat Treatment system provides a daily heating and cooling cycle to safely maintain dairy products up to two weeks before a complete disassembly and cleaning is required. 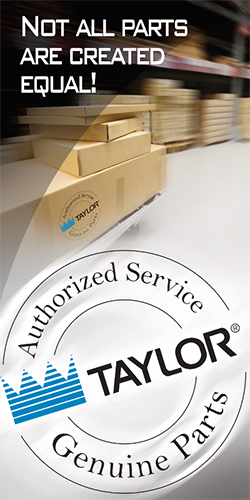 Heat Treatment freezers address food safety, product waste, maintenance and repair cost concerns. Offer four separate shake flavors: chocolate, vanilla, strawberry and an optional flavor. Place the cup on the cup holder below the door spout and press the proper flavor button. 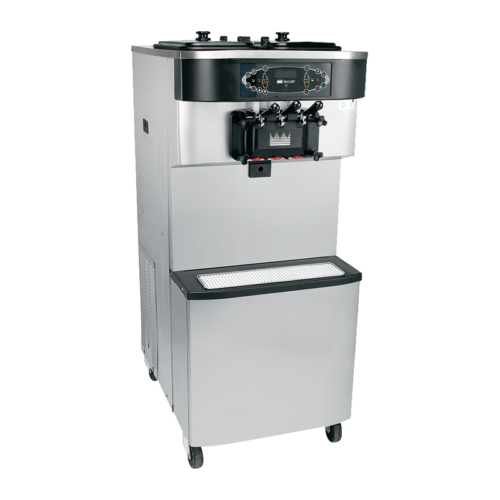 Frozen shake mix and syrup are automatically blended and dispensed into the cup. When the cup is properly filled, the portion control shuts the syrup off just before the dispensing door closes to assure no carry over of flavor or color. 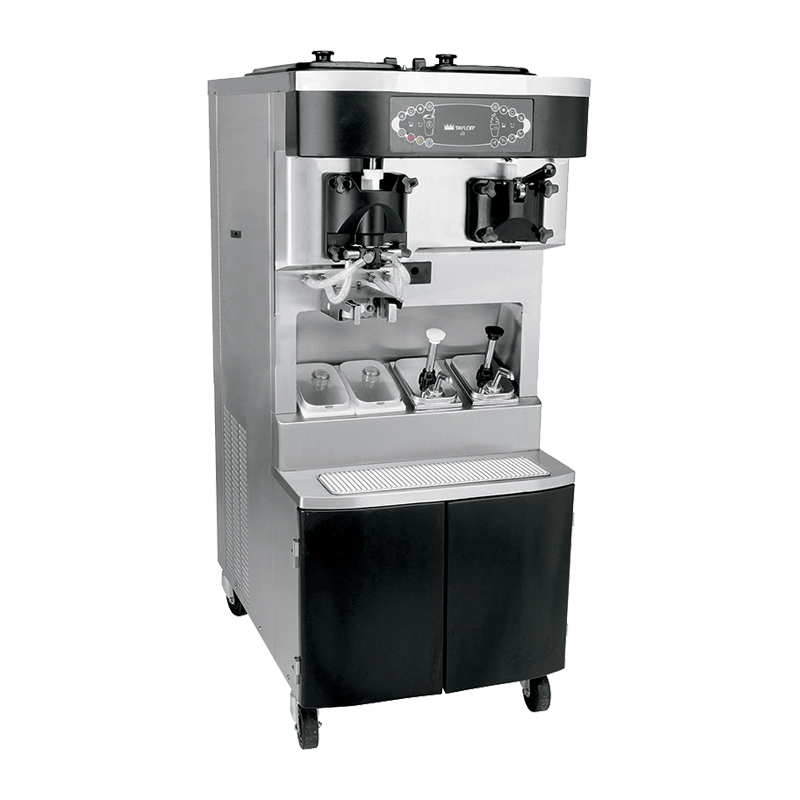 Syrup delivery system allows syrups to be dispensed from the original packaging, located in the lower front compartment. Syrups may contain small, soft particulates, such as pulp and seeds, to serve premium quality shakes. 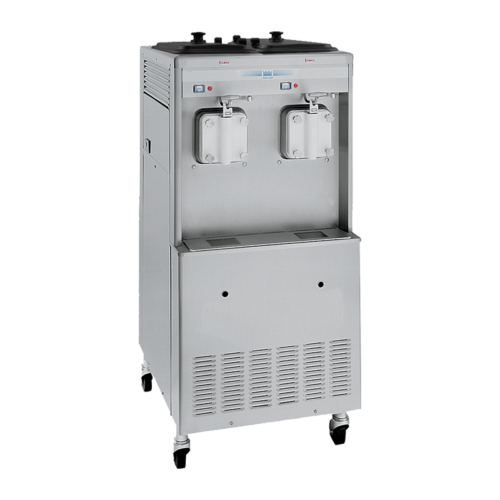 Peristaltic pumps deliver the proper amount of syrup for the best flavor and consistency. For each new syrup container, the microprocessor control calibrates the proper syrup flow accurately the first time, without additional adjustments. Ergonomic draw handle with hidden adjustment screw allows the operator to set the proper draw rate. Star design pattern is integrated into the dispensing door, reducing operator replacement parts. Microprocessor touch controls are embedded in durable tempered glass panel. Multiple languages are selectable: English, Danish, French, German, Japanese, Español and Swedish. 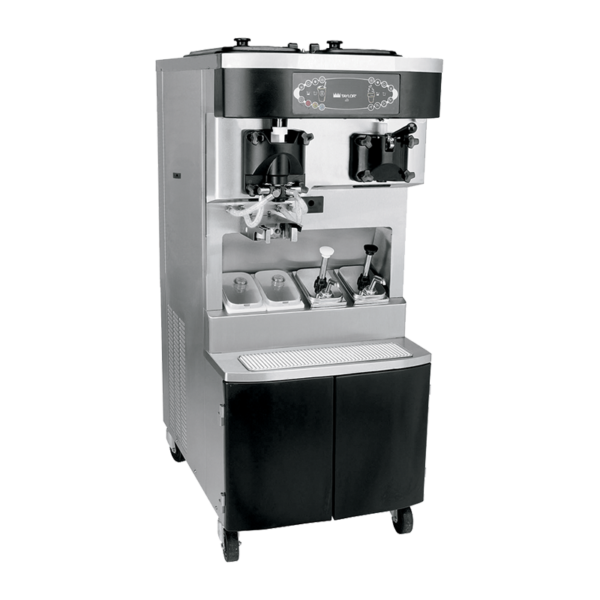 Viscosity is continually measured to serve consistent quality shake and soft serve. LED displays the number of days to brush cleaning. Temperatures in the hoppers or freezing cylinders may be displayed at any point of operation. History of temperatures and times during the last 366 heat cycles may be viewed from the fluorescent display. 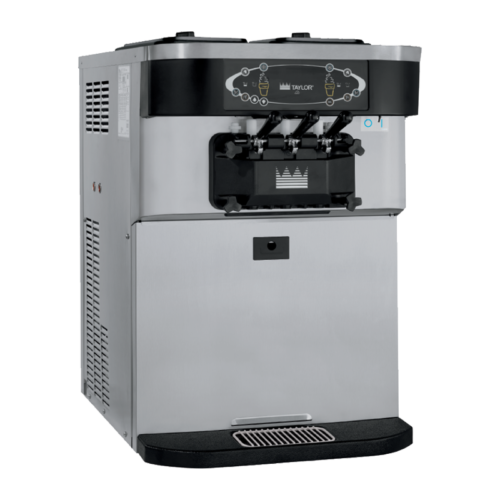 Four compartment syrup rail for sundae toppings; two heated with syrup pumps and two room temperature with lids and ladles. Mix Low light and operator enabled audible alarm alert the operator to add mix. When the Mix Out light flashes, the unit automatically goes into standby mode to prevent damage. Two, 20 quart (18.9 liter). Refrigerated to maintain mix below 41 ºF (5 ºC). Air/mix pumps deliver the precise amount of air and mix to the freezing cylinder. Front casters have a locking feature for operators to keep equipment in place. The lock can be released to move the equipment for cleaning.